Shelby High School was first mentioned in local papers of the time as being established in June 1877 by Professor J.A. Smith with G.W. Sharpe and Miss Laura Sharp as instructors. Two articles of early 1887, mention Miss E.A. Draughton as an assistant at the Shelby School. Attendance was recorded as ninety. It is not certain whether this was an early public or private school. Little information is available on public schools in Shelby prior to 1901, when all the records burned. Shelby Graded School was opened in 1892 after Shelby Public Schools voted a special tax levy to support schools on March 7, 1891. Shelby Graded School was housed in the building formerly occupied by Shelby Military Institute. The first graduating class exercises in the history of the school were held on April 28, 1905. The school's enrollment was 400. The two receiving diplomas for complete the 10th grade were Misses Gertrude Hamrick and Mabel Jetton. Clyde E. Hoey presented the scholarship medal to Gertrude Hamrick. The public was not invited because the assembly hall was too small. The Shelby Grade School building burned on October 13, 1905. Nothing was saved from the building which had served Shelby students for over 30 years. At the beginning of the term in 1906, the higher grades were housed in the court house. The new Shelby Grade School building which was constructed at a cost of $30,000 was opened around January 1, 1907. Shelby Grade School operated as a grade school 1-10 until 1923. As the new elementary schools were opened from 1923 to 1927, the elementary grades were phased out of Shelby Graded School. While the elementary grades were being moved out to new schools from 1923 to 1927, Shelby Graded was referred to as Central School. The name change to Shelby High School came about in 1927-1928 when only grades 8 to 10 remained. Shelby High was housed in the old Shelby Graded building at 204 West Marion Street until a new building was completed in 1938 at 400 West Marion Street. A great deal of time and effort went into securing the high school building. Superintendent Ben L. Smith and the Shelby Board of Education began discussions in 1931 regarding their desire for a new high school building. Plans, architectural drawings, a site, funding, issuing of bonds, exchange of the “light plant”, securing a matching grant from the Public Works Administration and postponements due to the depression were constant topics of board meetings from 1931 to 1937. When Superintendent Smith resigned on August 16, 1936, he named the erection of a modern high school building as one educational objective he had hoped to attain before leaving Shelby. His successor, Walter Abernathy continued the drive for a high school building. Shelby mayor Harry Woodson and the city council had applied for matching funds for building a municipal electric generating plant through Secretary of the Interior, Harold Ickes, who was also Administrator of Public Works. Mr. Weathers told Mayor Woodson that Shelby needed a new high school building much more than a power plant. The two men flew to Washington to request funds originally requested for a generating plant be exchanged for a new high school. Ickes told them to have the city council pass a resolution agreeing and authorizing the change, send an application, and he would approve the request. On January 31, 1938 the new building was inspected and plans for a formal opening were discussed. State Superintendent of Instruction, Clyde A. Erwin, was invited to speak. In 1937, the local tax vote made it possible to renew membership in the Southern Association, which had been lost during the depression. A full time director of physical education, a full time band director, and an additional home economics teacher so all girls might take the course were employed with a tax increase. Grades 10-12, moved to its new location on Dixon Boulevard in 1960. The dedication for this school was held on September 10, 1961. Terry Sanford was the principal speaker. The main building, band building and field house cost $908,046. The stadium and press box cost $83,330. 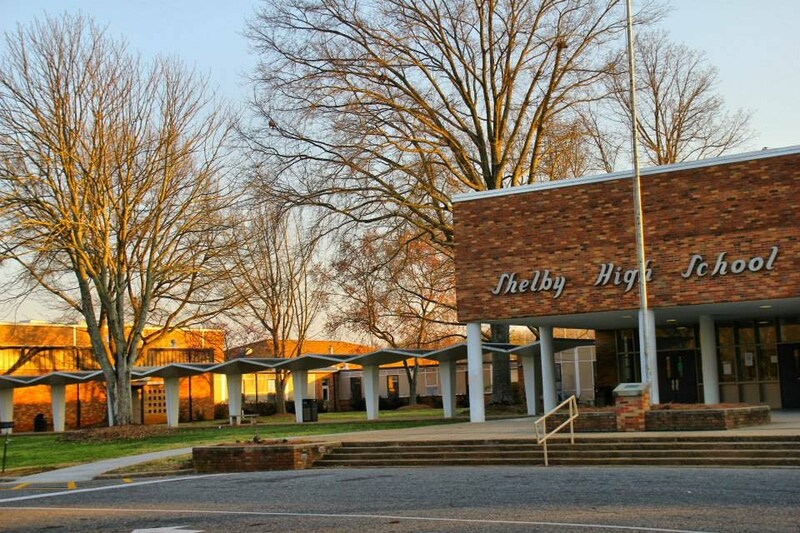 New facilities added to Shelby High include a classroom addition in 1966, an occupation addition in 1974, Brown Auditorium in 1976, a natatorium (the swimming pool) in 1978, and computer classrooms, a student commons and a band room addition in the 1990’s. With the organization of the middle school, grade nine was transferred to the high school in 1987.